This year’s Derby City Classic is going to be a very entertaining event. The venue at the Horseshoe Casino in Elizabeth, Indiana is always spectacular. Hundreds of tables, numerous vendors and stellar match play sets the scene for one of the pool’s greatest stages. If the tournament lives up to all the hype, the individual who make the best decisions will have a fighting chance to lift the all around championship trophy at the end of the week. I believe that there are 7 keys to winning at the derby. Think about them and you can use them to play more competitively in any venue. High-level competition causes everyone to make mistakes. Even “lock down” safeties will get returned, which will make things seem “unfair.” When playing in such a talented field, this is inevitable. The champion will be the person who can recover quickly from the frustration of bad breaks and maintain confidence and composure. Every player is going to get bad rolls, the key will be to accept this from the first shot and embrace the challenge. Because the tournament consists of 3 events, each having a shorter race format, the player who can choose and commit to the right shot and execute it, will be in the mix as the weekend approaches. Each game will require a different set of challenges and demand different types of ingenuity. Sound mechanics, position play and defensive execution will allow a player to become a serious threat. Knowing how to break the balls effectively will also be key to success. 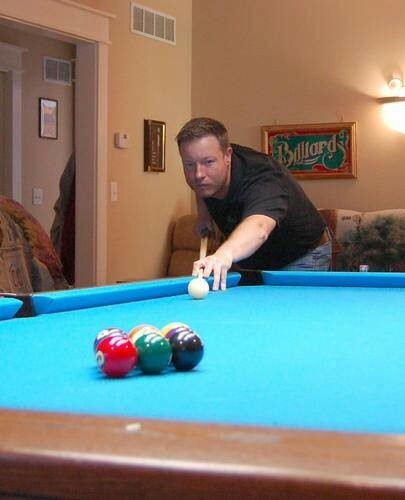 Whether the game is bank pool, one pocket or 9-ball, cue ball control is imperative. Losing control of the cue ball will equate to games lost over the course of the tournament. Practice your break! As with many past Derby City Classics, finishing high in any event can put a player in the hunt for the all around. With this in mind, you must give every single shot your upmost attention. Taking unnecessary risks will inevitably result in losses. Playing smart pool and being patient enough to keep your opponent locked down will be another key to success. Pace will also factor. With the length of the tournament there will possibly be some very long days. Being able to stay calm and remain patient will be critical. As with all tournaments, there are many ways to play a most shots. The winner will be the person that is the most creative, imaginative and the one that continually exhibits strong visualization techniques. In essence, just think about what you are going to do, then do it! When we’re under pressure, most of us have the tendency to speed up. If we allow this to happen it is inevitable that we will make mental mistakes. Staying tension free and maintaining a nice smooth tempo will be an important part of playing well. Top professional players tend to slow everything down to stay in a nice rhythm. When you’re playing in a big tournament, you’ll need to do the same thing. Take extra time in between shots, walk around the table slower, slow down your backswing, and you’ll maintain a good tempo and play quality pool. Health and fitness is becoming a much bigger part of most pool player’s practice regimens. It is not just about eating the right foods or strengthening muscles; players are now trying to build physical and mental stamina so they can maintain focus throughout a 10-12 hour day. Any tournament or competition is going to require a sound mental game and these 7 elements highlight the skills that are necessary to win any championship. So think about these skills and adopt them as part of your pool game. Maybe with some practice this will be the year that you snap off the all-around championship in Elizabeth, Indiana.